There's no getting around it - laundry happens. It is a boring fact of life, and something that every child should learn as a part of growing up, getting older and becoming an independent adult. In our busy lives, it seems as if there is not enough time to impart these skills to our youth, but hey, we are all busy, Moms, Dads and Kids alike……and we all wear clothes, use towels, etc. and the busier we get the quicker those molehills turn into mountains! Like myself, most Moms find that instead of trying teach our child how to do the wash, it is simply quicker to just do the laundry in a spare moment, which is usually when the kids are out doing something else, or sleeping. By trying to keep peace and harmony, we (and the guilty mom writing this) are doing a disservice to them, and especially to those teens who will be off to college in the blink of an eye without a clue when it comes to basic daily (real life) chores. Kids can be, and should be taught at an early age the basic task of sorting laundry, and as they get older how to wash and dry their clothes. If you start them young, take baby steps, and find ways to make it fun, they won’t even realize that you have taught them a valuable skill they will use all of their lives! Here are some suggestions of laundry jobs your child can probably do at certain ages. I started doing laundry on my own at 12. Every child is different and will catch-on at their own pace, so only you can be the judge of when they are capable of finally taking on 100% of the laundry. Heck, there are full grown adults who still don’t get it right! This might seem crazy, but at this age kids love to help. Yes, it will require more time and a lot more patience on your part, but planting the seed early will reap many rewards. Focus on the positive and pour on the praise for their efforts! 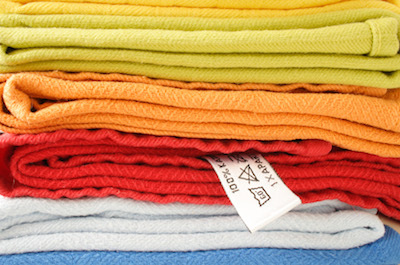 Try jobs like sorting colors - whites, darks, colors, towels etc. Have them help you put items into the washing machine. When folding laundry, give them a washcloth to fold, or try pairing socks. At this age you can probably start to show hem how to work the settings on the washer, which way to turn the knobs and push the start button. Learning to fold their clothes, and other items is definitely something they can do, although don’t expect perfection. Tools like MiracleFold® Junior Size Laundry Folder Clothes Folder T-Shirts Pants Towels Organizer Fast Easy and Fun Time Saver (Sky Blue) can even make it fun. Kids can also help transfer laundry from washer to the dryer, add dryer sheets, and most all kids love cleaning out the lint trap! Show them how to sort in detail, like reading care labels to see what needs hand washing and which items shouldn’t go in the dryer. This might also be a good time to have the “is it really dirty?” discussion, if you haven’t already. Checking pockets for forgotten items and showing them how to turn printed t-shirts and jeans inside out, will show them how to help preserve their clothes (and your washer). Teach how much to load in the washer for effective cleaning. Show how you measure detergent, along with how and when to set the washer for hot, warm or cold water. If you hang clothes to dry, and they can reach, then go for it. They can also probably start to effectively organize their drawers and put away clothes. More detailed responsibilites can be taught, for example how to pre-treat stains, and when to use bleach or fabric softener (if used in your household) and how much to use. Then before you let them go off and running on their own, supervise (without hovering) for some “solo” loads. If you have a front loading washer, show them how to care for the machine after they have finished - checking the drain trap or seal for any debris, wiping down the rubber gasket and leaving the door open to dry.